Cloud migration or disaster recovery is not only about replicating your virtual machines but also about end to end application recovery that is tested multiple times, error free, and stress free when you decide to migrate or when disaster strikes, which are the Azure Site Recovery promises. If you have never seen your application run in Microsoft Azure, chances are that when a real disaster happens, the virtual machines may just boot, but your business may remain down. The importance and complexity involved in recovering applications was described in the previous blog of this series - Cloud migration and disaster recovery for applications, not just virtual machines. 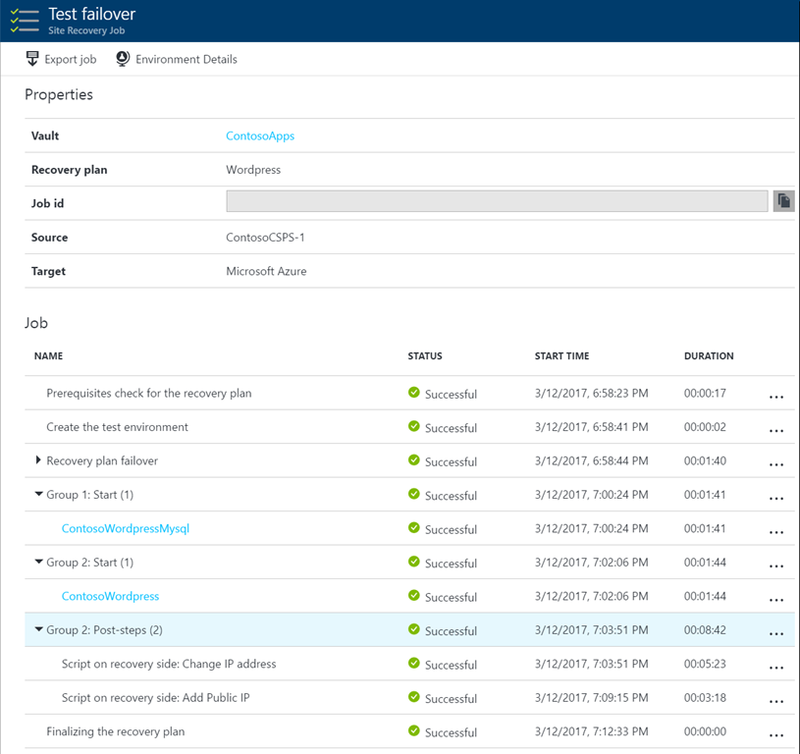 This blog covers how you can use the Azure Site Recovery construct of recovery plans to failover or migrate applications to Microsoft Azure in the most tested and deterministic way, using an example of recovering a real-world application to the public cloud. 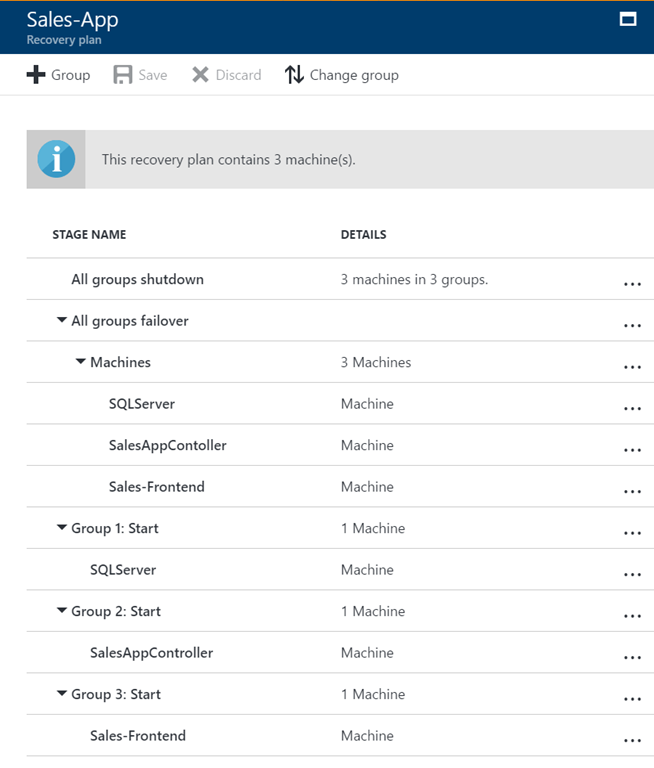 Why use Azure Site Recovery “recovery plans”? Recovery plans help you plan for a systematic recovery process by creating small independent units that you can manage. These units will typically represent an application in your environment. Recovery plan not only allows you to define the sequence in which the virtual machines start, but also helps you automate common tasks during recovery. Essentially, one way to check that you are prepared for cloud migration or disaster recovery is by ensuring that every application of yours is part of a recovery plan and each of the recovery plans is tested for recovery to Microsoft Azure. With this preparedness, you can confidently migrate or failover your complete datacenter to Microsoft Azure. A recovery plan is a group of virtual machines generally comprising an application that failover together. Using the recovery plan constructs, you can enhance this group to capture your application-specific properties. The recovery plan can be customized to ensure that the virtual machines come up in the right order post a failover. The SQL backend should come up first, the middleware should come up next, and the web frontend should come up last. This order makes certain that the application is working by the time the last virtual machine comes up. For example, when the middleware comes up, it will try to connect to the SQL tier, and the recovery plan has ensured that the SQL tier is already running. Frontend servers coming up last also ensures that end users do not connect to the application URL by mistake until all the components are up are running and the application is ready to accept requests. To build these dependencies, you can customize the recovery plan to add groups. Then select a virtual machine and change its group to move it between groups. Next it triggers failover of all the virtual machines of the recovery plan in parallel. The failover step prepares the virtual machines’ disks from replicated data. Finally the startup groups execute in their order, starting the virtual machines in each group - Group 1 first, then Group 2, and finally Group 3. If there are more than one virtual machines in any group (for example, a load-balanced web frontend) all of them are booted up in parallel. Sequencing across groups ensures that dependencies between various application tiers are honored and parallelism where appropriate improves the RTO of application recovery. Recovering large applications can be a complex task. It is also difficult to remember the exact customization steps post failover or migration. Sometimes, it is not you, but someone else who is unaware of the application intricacies, who needs to trigger the failover. Remembering too many manual steps in times of chaos is difficult and error prone. A recovery plan gives you a way to automate the required actions you need to take at every step, by using Microsoft Azure Automation runbooks. With runbooks, you can automate common recovery tasks like the examples given below. For those tasks that cannot be automated, recovery plans also provide you the ability to insert manual actions. For many common tasks, you can use a single runbook and pass parameters to it for each recovery plan so that one runbook can serve all your applications. To deploy these scripts yourself and try them out, click the button below and import popular scripts into your Microsoft Azure Automation account. With a complete recovery plan that automates the post recovery tasks using automation runbooks, you can achieve one-click failover and optimize the RTO. A recovery plan can be used to trigger both a failover or a test failover. You should always complete a test failover on the application before doing a failover. Test failover helps you to check whether the application will come up on the recovery site. If you have missed something, you can easily trigger cleanup and redo the test failover. Do the test failover multiple times until you know with certainty that the application recovers smoothly. Each application is different and you need to build recovery plans that are customized for each. Also, in this dynamic datacenter world, the applications and their dependencies keep changing. Test failover your applications once a quarter to check that the recovery plan is current. 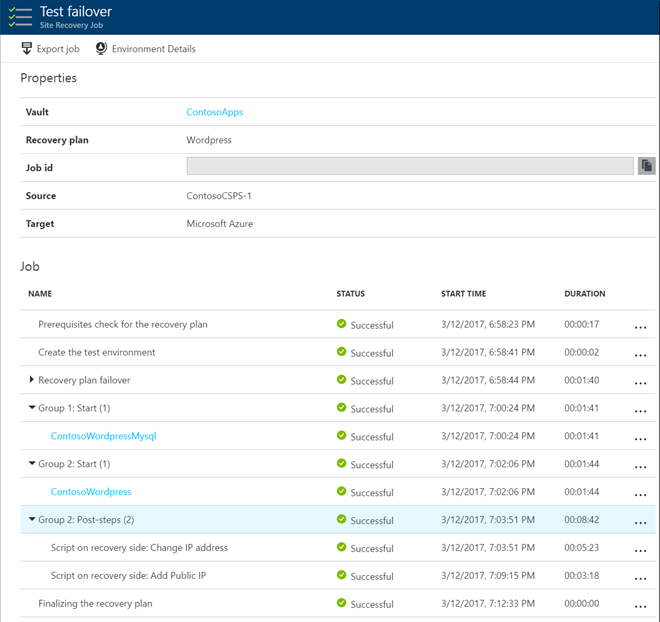 Watch a quick video of a two-tier WordPress application failover to Microsoft Azure and see the recovery plan with automation scripts, and its test failover in action using Azure Site Recovery. The WordPress deployment consists of one MySQL virtual machine and one frontend virtual machine with Apache web server, listening on port 80. WordPress deployed on the Apache web server is configured to communicate with MySQL via the IP address 10.150.1.40. Upon test failover, the WordPress configuration needs to be changed to communicate with MySQL on the failover IP address 10.1.6.4. To ensure that MySQL acquires the same IP address every time on failover, we will configure the virtual machine properties to have a preferred IP address set to 10.1.6.4. With relentless focus on ensuring that you succeed with full application recovery, Azure Site Recovery is the one-stop shop for all your cloud migration and disaster recovery needs. Our mission is to democratize disaster recovery with the power of Microsoft Azure, to enable not just the elite tier-1 applications to have a business continuity plan, but offer a compelling solution that empowers you to set up a working end to end disaster recovery plan for 100% of your organization's IT applications. You can check out additional product information and start protecting or migrating your workloads to Microsoft Azure using Azure Site Recovery today. You can use the powerful replication capabilities of Azure Site Recovery for 31 days at no charge for every new physical server or virtual machine that you replicate, whether it is running on VMware or Hyper-V. To learn more about Azure Site Recovery, check out our How-To Videos. Visit the Azure Site Recovery forum on MSDN for additional information and to engage with other customers, or use the Azure Site Recovery User Voice to let us know what features you want us to enable next.